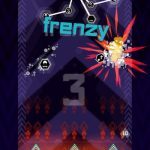 Crazy Labs has been one of the longest-standing mobile game developers and has released a wide variety of fun and exciting casual arcade games for both Android and iOS platforms since 2013. Run Sausage Run!, Miraculous Lady Bug and Cat Noir, and the Cheating Tom series currently sits at the top of its portfolio but several other games contributed to Crazy Labs making its mark on top 100 lists of mobile games in more than 10 countries. Coin Rush! is Crazy Labs’s newest game and it promises the same level, if not more, of fun and excitement for players of all ages to love and enjoy. The game’s screenshots may easily give you an idea that Coin Rush! is just another casual arcade game that can only be challenging for kids. Don’t let it fool you though, as Coin Rush! has plenty to offer as far variety and depth of challenge is concerned. If you are up to a challenging time-passer that tests the limits of your hand-eye coordination and reaction time, then download Coin Rush! Now and see how far your skills can take you! Coin Rush! gives you control over a coin and your goal is to keep the coin rolling till you reach the finish line. Tapping and holding the screen while swiping left and right steers the coin and how wide and fast you turn is based on how far you swipe on your device’s screen. Of course, there will be various obstacles along the way on top of the wild ride that the path itself offers. Spinning barricades, smashing hammers, enemy coins, and other bizarre objects pop up out of nowhere as you traverse a short but ever-shifting stage. It’s important to be fully conscious about your entire surroundings but stay relaxed enough to make mistakes borne of panic. As you finish each stage, the succeeding one is guaranteed to provide even more challenges. There are no tutorials available in Coin Rush! and truthfully enough, there’s hardly any need for one. You will be directed as to how you can control the coin’s movement as you start the game and you will be advised as well to avoid hitting objects. While that is all that it offers, everything else will be understood naturally as it all boils down to the game’s base objective: keep the coin rolling till you reach the finish line. It certainly is a challenging game with super simple mechanics and if you are having some difficulty clearing some stages, then you will certainly need to read on as our Coin Rush! beginner’s guide contains some useful tips, cheats and strategies to make it easier for you to unlock and complete levels in the game. It may sound a little awkward but prepping your device’s screen and ensuring that it’s clean can make some difference in your performance as you play the game. Coin Rush! has simple mechanics and controls but a lot of people will find it very challenging to perform consistently enough across multiple levels of the game on a crystal clear, blemish-free screen and more so if your screen isn’t as tidy as it can be. It all still depends on how comfortable you are with the texture and overall consistency of your touch on the screen so if all is fine for you then consider yourself half set to go. Another thing to consider is your playing finger’s condition before you jump into the game. Coin Rush! is not like other runner arcade games in that you will have to keep you finger on the screen throughout the level. Releasing you hold will complicate the controls and you can only safely do so once you reach the finish line. So what you would naturally want is to have a comfortable feel that you can stay consistent with for the duration of your play time and seriously enough, the surprising challenge this game has to offer can easily make a lot of players sweat uncontrollably. IF it happens to you, feel free to take breaks in-between each level run and rest or condition your fingers again before taking on the next level. As there are no practice areas or modes to get accustomed to the control sensitivity of Coin Rush! and with the absence of any settings to adjust the same in your favor, the only recourse left for you to do is to familiarize yourself with it as fast as you can on the earlier levels. Naturally, you will fail a lot but what you need to focus on at this point is to have a good grasp of the control sensitivity in that you can make the slightest or the widest turn as the need for you to do so arise. It is important to get used to the control sensitivity of Coin Rush! early on as the first few levels are the least congested and easiest ones that you can play around in and sacrificing a bit of gameplay and time at this point in time save you a lot more later on. 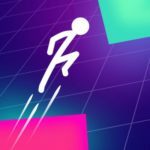 There are no backsteps to previously completed levels so it is best to master you turns before you head forward into levels with increasing challenges. 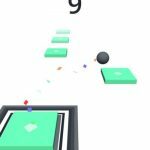 Like endless runner games and other vertically flowing arcade games, there are a lot of things to see ahead of the way and these games are such designed to give you ample time to prepare for what’s to come. In a lot of cases though, many players especially those new to the genre, have tendencies to keep their eye on their character or, in this case, the coin. If you are one of those people who find it difficult to break the habit of watching the coin constantly, then practice hard early on to maintain your focus on the top of your screen. Unlike most comparable games as well, Coin Rush! is more challenging in the sense that you won’t easily see what’s ahead or that it matters as much as the design of the game banks on constantly shifting terrain and obstacles that suddenly appear giving you little chance to make hasty maneuvers. Despite that, keeping focused well ahead of the path while trying to see the entire screen and everything in it is still the better alternative over keeping a close eye on the coin. On top of the preparations you are advised to make prior to starting your game and some time to invest on getting accustomed to the control sensitivity level, the next thing you would want to master is progressing with the slightest slide of your finger to cause as little turn as needed to go over some obstacles in your path. 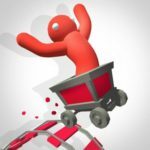 As it can be a natural tendency for everyone to instinctively go wide with turns to get as far away from the obstacle as possible, doing so regularly will more likely put you at a disadvantageous position. Mastering the controls poses more importance on making the slightest turns possible to avoid obstacles without straying too far off the path and as the levels become more clogged with various obstacles that leave less and less room for mobility, it is important to learn how to make slight movement adjustments but at the same time just keeping close to the obstacles themselves. There are definitely a lot of instances that would require you to go far and wide especially when there is only one path towards the goal and bridges or ramps towards reaching it will be situated on nearly opposite ends of the path. These are, of course, exemptions to the general rule but all the same, what you have to avoid is over-steering and making effort to swipe the opposite direction just to get back on the right track. Despite best efforts to master the controls, you will most likely still go beyond the necessary swerves and have to correct your angle again. It is no doubt a difficult skill to master exercise some patience and you are bound to eventually get the hang of it. There’s always more than one path towards reaching the finish line in Coin Rush! and truthfully enough, you can freely choose however you please most especially on the earlier stages. As most levels do have inconsistencies starting from the ground the coin rolls on, you need to constantly be prepared for what’s to come. Every so often, surprise obstacles pop up out of nowhere and in several instances the only path towards progress only becomes available just in the nick of time. As such, it would only be wise to maintain the coin in the middle of the screen as much as possible to ensure peak mobility. Making effort to stay in the middle of the path doesn’t necessarily mean you absolutely have to stay there as, again, there will be several instances where the only way forward is through a sudden, and perhaps even a narrow, road that can appear or be made available a little distant from the center. The idea here is to basically give you as much space as possible to navigate freely and be able to swerve left and right when the need to do comes. As the challenges that come from obstacles and ever-shifting landscapes should be enough to make it difficult for you to reach the end of a level, keeping both sides of the path by exerting some effort to stay in the middle makes it highly likely that you won’t fall of the stage as well. This may sound a little too complex at first, but it applies to moving and shifting obstacles that abound in a lot of levels. The most common examples of these obstacles are perhaps the rotating barricades and as the bars move around you have a bit of time to determine where it will hit and which spots are safe to traverse. The same idea applies to the continuously pounding hammers that are usually found in pairs one after another. You can predict if the hammers will hit you as you pass under it and avoid needless evasive actions that may put you at risk from being hit by the other one. There are numerous other similar obstacles in the game but regardless of how dynamic each level and the obstacles in it can go, remember that there will always be patterns that can give you a big advantage if you can identify early on the safe spots in the path through predicting outcomes. One factor that makes Coin Rush! fun and addictive is the amount and variety of surprise obstacles that you will encounter as you progress through the game. Although levels are relatively short in distance, completing each one, especially on the latter levels, will prove to be quite a challenge. In certain occasions, you may even find that your subsequent runs on the same stage won’t take you as far as you did from before so if you want to start off from where you failed, grab the opportunity to watch a short video ad to continue on the level and have a better chance of completing it. Although you can only use this once per level, it is still good to have and an opportunity that should not be ignored. Well, that is all we have for our Coin Rush! beginner’s guide. Although it’s a casual game designed for you to enjoy in your free time, it’s simply addictive for some, frustrating for others, or even a mix of both for the rest. In any case, we hope that the tips, cheats and strategies we shared with you in our guide will steer you to find the game more fun and exciting than ever. If there are additional tips and tricks you would like to share with us relative to the game, you can always do so through our comment section!